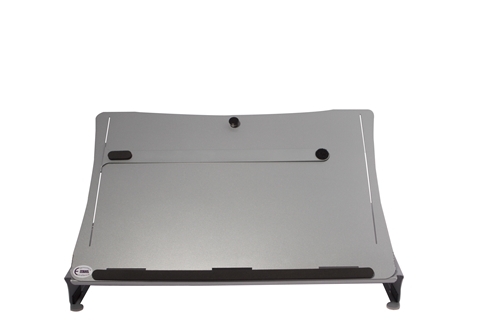 The metal U Slope copy stand serves 8 functions in one to maximize limited space: Adjustable Writing Slope - Computer Document Holder - Adjustable Reading Slope - Book Stand - Laptop Stand - File Holder - Portable Desk with pen and pencil storage. 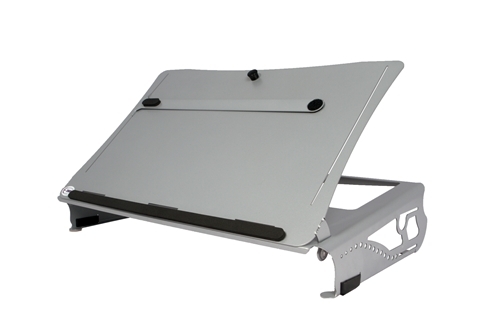 U Slope transforms instantly from a document holder into an ergonomic reading and writing desk by simply lowering the adjustable slope and gliding forward over your keyboard. For reading or laptop computer use, angle the sturdy reading/writing platform up and relax back into your chair. U Slope reduces reaching and twisting because your papers are directly in front of U and your computer monitor. 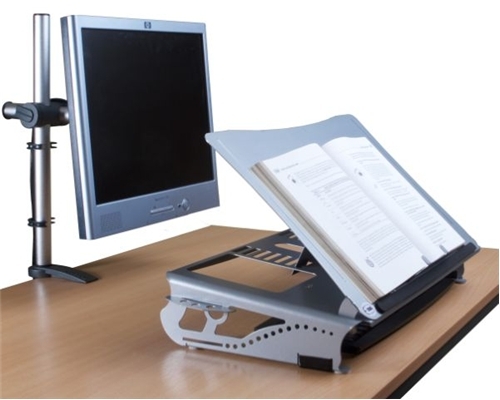 Positions your documents to any angle to promote better posture and prevent neck and back ache. Ergonomists recommend using a higher desk height for reading and writing than for typing. 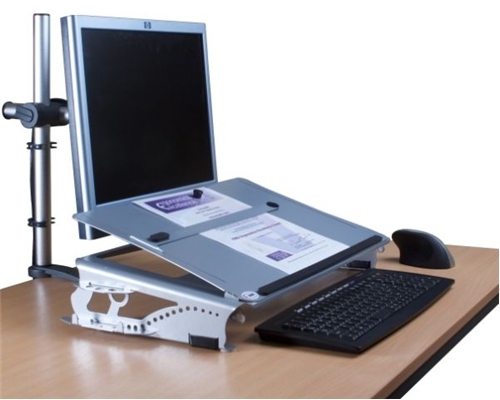 The U Slopetilts and automatically raises the desk height for you, eliminating the need for a separate raised reading and writing area. Adjustable for reading and writing with 6 angles up to 45°. Full clearance above the keyboard, so you can freely slide the U Slope forward for reading/writing and backward for keying. Clearance allows for use with ergonomic keyboards and wrist supports. Sturdy metal construction holds up to heavy use. 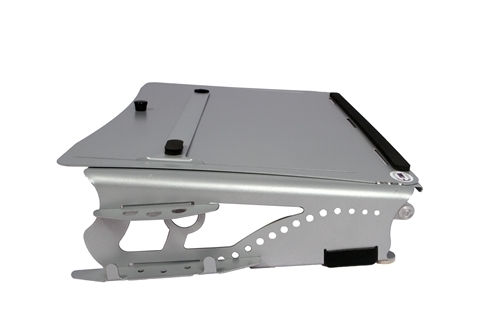 Removable 6.5" long bookholder ledge accommodates large documents and media (e.g., blueprints, x-rays). Removable 4" short file ledge supports writing and reading file folders, large books, binders and documents and pens. Line guide facilitates reading of detailed data. Magnetic document holder holds papers at the optimal position to reduce fatigue. Suitable for left or right handed users. Optional non-slip foot pads (included). U-SlopeShort file ledge can also hold thick books. U-Slope keeps writing and reference papers close to reduce eye and neck strain while working at a computer.